Acknowledged author Joshua Dressler wrote Cases and Materials on Criminal Law (American Casebook Series) comprising 1139 pages back in 2015. Textbook and etextbook are published under ISBN 1628102055 and 9781628102055. 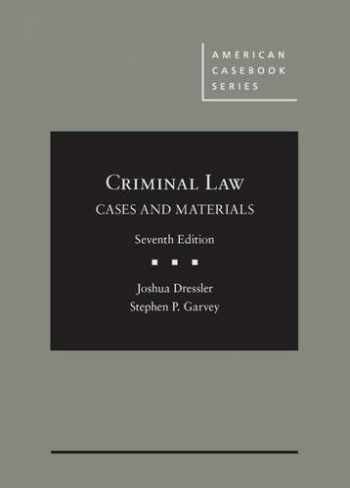 Since then Cases and Materials on Criminal Law (American Casebook Series) textbook received total rating of 3.5 stars and was available to sell back to BooksRun online for the top buyback price of $25.99 or rent at the marketplace. NO highlighting or writing. Spilled a little water on the book, so 2-3 pages are a bit wrinkly. Otherwise, in great condition.